This article is about the anime item. For the similar manga item, see Duel Arena (manga). "Duel Arena" redirects here. For the official online Yu-Gi-Oh! Trading Card Game simulator, see Yu-Gi-Oh! Duel Arena. During the Duelist Kingdom tournament, 2 players Dueled in what was known as a "Dueling Arena". Each arena projected giant holographic images of the cards the players activated or summoned. Some arenas also contained properties of specific type(s) of land masses that could change a monster's ATK and DEF depending on what terrain was favored by what monster (see Field Power Bonus). According to Kaiba's schematics of Duelist Kingdom, there are ten Duel Arenas spread throughout the island, including within Pegasus' Castle. Duel Arenas were also seen in the KaibaCorp building, KaibaLand and in Duke Devlin's gameshop. KaibaCorp developed the Dueling Arenas. 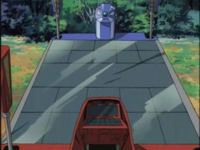 Their later product, Duel Disks could be plugged into the arenas with a retractable cable using the Arena's holographic display instead of the Duel Disk's. In the manga, a different device is used in Duelist Kingdom called a Battle Box. It was a smaller and more realistic in terms of real-world technology version of the Dueling Arenas. These devices were invented by Kaiba Corp. and would later be replaced by another of their inventions in Battle City, the Duel Disk. Crow standing on the Dueling arena. Only a few arenas exist by the time of Yu-Gi-Oh! 5D's. Bashford possesses one which he built himself just so that he could Duel against his son Koki. And has also kept it functioning in the hope that his son would return one day. However it was later completely destroyed after the Duel between him and Crow ended. This page was last edited on 25 August 2017, at 02:58.